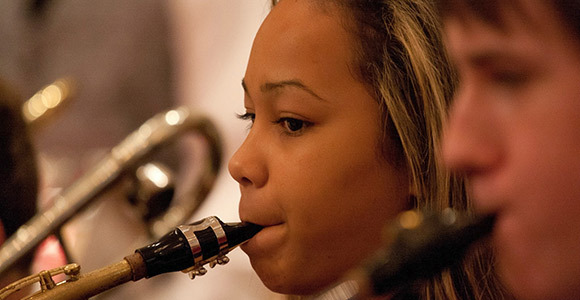 The SCA instrumental program provides instruction in beginning, intermediate, and concert bands. Our band is a member of the Florida Bandmaster’s Association and participates in All State, Solo and Band Festivals. BEGINNING BAND - The beginning band instructs in the care and use of an instrument along with basic music theory and performance. PEP BAND - All 8th-12th grade band members participate in the SCA Pep Band. This group performs at all home football games and various school spirit events throughout the year. CONCERT BAND - The concert band is for students who have been playing for at least one school year and is comprised primarily of 7th and 8th graders. This group performs 2nd and 3rd year music and plays in pep band and some outside performances. JAZZ ENSEMBLES - SCA offers band members the unique experience of performing jazz. The middle school jazz ensemble are band members in 7th and 8th grades. The high school jazz ensemble are band members in 9th – 12th grades. All jazz players must be members of the concert and symphonic band programs and are comprised of saxes, trumpets, trombones, rhythm section. The only exceptions are piano, bass/acoustic guitars.